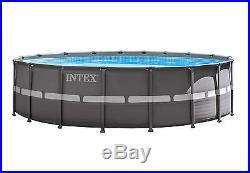 Intex 18' x 52 Ultra Frame Swimming Pool Set with Sand Pump & Saltwater Combo. 52-inch height and 18-foot diameter provide a water capacity of 6,981 gallons (26,423 L) when filled to 90% full. Soft gray laminated pool liner, brilliant white copings and blue tile print interior create a luxurious appearance. All rust-resistant metal beams and joints snap together for fast, easy construction. Includes maintenance kit, pool cover, ground cloth, pool ladder, and volleyball set. Includes Intex 1600 GPH Krystal Clear Sand Filter Pump to help keep your water sparkling clean with little maintenance. Keep cool and have even more fun with friends and family on those hot summer days with the Intex 18' x 52 Ultra Frame Swimming Pool Set with Sand Pump & Saltwater Combo. With an 18-inch diameter and all the accessories you'll need for a great summer in the sun, the Intex 18' x 52 Ultra Frame Pool Set is easy to assembly and maintain. This convenient swimming pool set includes a ground cloth, debris cover, ladder, instruction DVD and a Krystal Clear Sand Filter Pump to keep your water clean and safe. Featuring a contemporary design that adds beauty to any backyard, this is the perfect pool to entertain family and friends at a value you can't believe. This above ground swimming pool features a 52-inch wall height and 18-foot diameter for a water capacity of 6,981 gallons at 90% full. It also features convenient draining with a garden hose drain plug. Proper installation of any above ground pool requires a setup area sufficiently larger than the desired pool to be leveled flat. Uneven ground, hills, or holes must be leveled before pool assembly begins. If severely uneven ground prohibits level ground, proper installation will not be possible. Only needs routine backwashing and replacement sand every 5 years. Built-in GFCI (ground fault circuit interrupter) instantly shuts off pump if electrical current comes in contact with water. Lowest maintenance and most efficient method of pool filtration. 52-inch A-Frame pool ladder is a perfect fit with complete interior side barrier to protect your children while swimming inside. Includes an 18-foot pool cover and deluxe ground cloth to keep out debris and protect your pool from dirt, rocks, and general wear. Instructional and maintenance DVD also included to help you get started. Ready for easy draining, the drain plug accepts a garden hose to drain water away. Deluxe maintenance kit includes: Leaf rake, curved wall brush, vacuum head, telescoping pole, and surface skimmer. Dimensions (L x W x H): 18 x 18 x 4.3 feet. Intex is the world leader in both designing and producing high quality, innovative products for indoor and outdoor recreation. Intex above ground pools, pool accessories, pool toys, airbeds, and boats are known around the world for their tremendous quality and value. This listing is currently undergoing maintenance, we apologise for any inconvenience caused. The item "Intex 18' x 52 Ultra Frame Swimming Pool Set with Sand Pump & Saltwater Combo" is in sale since Friday, April 28, 2017.